The Galaxy 5™ was designed for remarkable power housed within an incredibly lightweight and portable package. 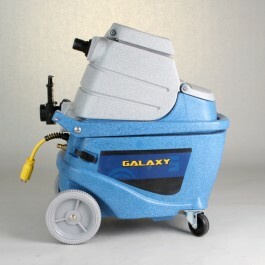 The Galaxy 5™ is the obvious choice for auto detailing and for those jobs where a small yet powerful unit makes more sense. Warranty : 2 years on parts & labor, lifetime on rotationally-molded housing. The amazing FiveStar™ is a small, self-contained unit with powerful brush agitation to clean carpets — small enough to clean tight spaces and corners, yet powerful enough to perform well in any commercial setting. It weighs only 40 pounds so it’s light enough for anyone to handle, plus the compact body design and fully adjustable handle make it a breeze to transport and store. Warranty : 2 years parts and labor, lifetime on rotationally-molded housing.